"This dish is not too spicy, and is very easy to make. It is best served over basmati rice." In a medium bowl, stir together tomato paste, salt, sugar, garam masala, ground cumin seed, ground red pepper, cilantro, jalapeno pepper, lemon juice, and coconut milk. Set coconut sauce aside. Heat oil in a wok or frying pan over medium-high heat. When oil is hot, add the mustard seeds, and cook until they begin to pop. Immediately stir in garlic, and cook until garlic begins to brown. Add shrimp, and cook until shrimp is opaque; this should take only a minute or two. 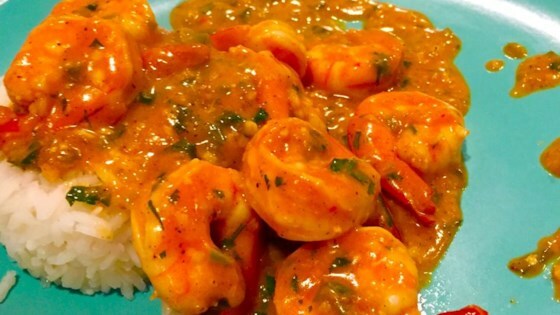 Pour the coconut sauce over the shrimp; cook until the sauce begins to simmer. In a small bowl, mix together cornstarch and water; stir into the sauce, and continue cooking until thick. I was extremely pleased with the ease of preparation and the taste. Excellent! I expected the recipe to be a bit on the spicy side, but it wasn't - even my 4 year old ate her share! DH looooooved this dish. Thanks for sharing. Made it just as written....excellent.